Dock Boggs was twenty-nine when agents of the Brunswick company-a major New York label with separate lines for “hillbilly” and “race” records-arrived in Norton, Va. to audition mountain talent. Boggs showed up at the Norton Hotel on Kentucky Avenue with a borrowed, second-rate banjo. Even with a half-pint of Guest River whiskey in his stomach he was intimidated by the crowd of pickers and fiddlers: “I stood around and pitched them high as a dollar, dollar and a half at a time-I mean nickels, dimes, and quarters-to hear them play. They wasn’t doing nothing but playing and I was working on a coal machine.” A. P. Carter of the Carter Family failed the audition; Boggs passed. He cut eight sides, four 78s, in New York City; the company wanted more but he demurred. Before traveling out of the Virginia mountains for the first time, Boggs went to the Norton haberdashery for a new suit, shoes to hat, socks to underwear; determined to walk the city streets with pride, he insisted on clothes that would draw no northern smiles. 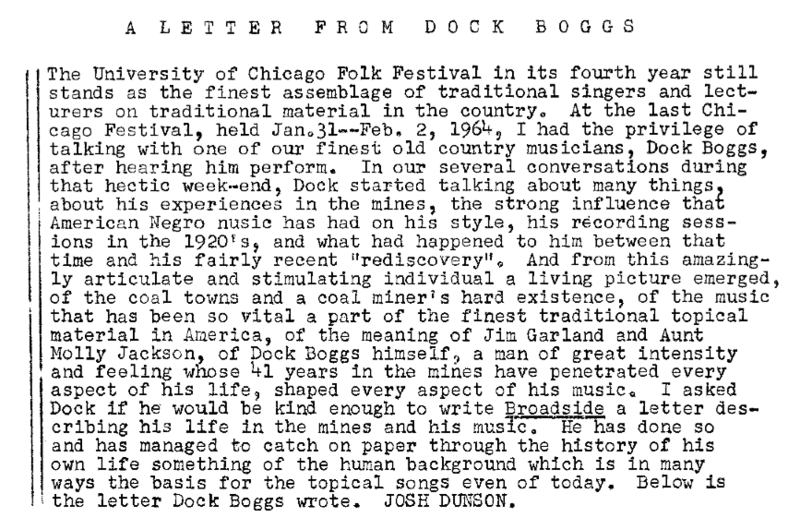 Dock Boggs quit the mines after his records were released, drew crowds to schools and houses, formed the Cumberland Mountain Entertainers, and signed a booking agent, but the records sold mostly where he carried them. Boggs recorded only four more songs in the 1920s-generic blues and sentimental parlor lyrics written by a Richlands, Virginia, variety store owner named W. E. Myers. Myers would send his “ballets,” or poems, to musicians he liked, hoping they would put his words to music. He’d release the results on his own Lonesome Ace label, which featured both a picture of The Spirit of St. Louis and the slogan “WITHOUT A YODEL,” because Myers loved Charles Lindbergh and he hated yodeling. Boggs cut “Will Sweethearts Know Each Other There,” “Old Rub Alcohol Blues,” and two other Myers efforts in Chicago in 1929; then the Depression destroyed the southern economy and Myers went bankrupt. Boggs pressed on, writing to record companies, traveling to Atlanta for a session with Okeh, which shut down just before he arrived, finally surrendering when a recording date with Victor in Louisville fell through because Boggs, knocking on the doors of his now penniless friends and relatives, could not raise the train fare. He drank hard, leaving home, even leaving the state for a week at a time, running to where no one would recognize him on the last day of a ten-day drunk, always returning home, where his wife looked right through him. Again and again his wife gave him the same ultimatum: she refused to sleep with him unless he gave up his music, and finally, not long into the 1930s, he did. Dock Boggs: It’s a pleasure for me to have the opportunity and honor of coming over to this college and get to play here. Since I’ve started playing music in the last three and a half, four years, why I’ve visited eighteen to twenty different colleges besides the festivals and [?] I went to. I didn’t know whether I’d start playing, but I decided for old time’s sake I’d get my old banjo back. I bought it in 1928, so when I went back to get it, I’d let a fellow keep if for me that was a single man, and when I went back to get it he was a grandfather. His wife’s a teacher too. She teaches school at Hayman, Kentucky. Been teaching for the last thirty years, or longer. We don’t, I don’t conduct my programs I put on like a lot of people do. We just mix ‘em up. Play. And my way of playing, I’ve got my own style of playing music and I have to tune sometimes, change tuning of my banjo, in order to play it in the old traditional time style. So, this piece I’m fixing to play you is a piece I tried out on when I got my first opportunity to make phonograph records in Nineteen and Twenty-seven. In Norton, Virginia, I was working on the coal machines at [?] Virginia. I started to play this piece and they stopped me—I played about a verse of it—there’s three of them, papers on their knees, and they took down the number of the piece and they marked “good” on the end of it. I started to play “Country Blues,” and I’ll tell you, I played about a couple of lines of that and they marked “Good” on the end of that, and the next thing was a contract. I was on my way to New York to make phonograph records in about three weeks. It surprised me because I was working in the mines. After that my wife she didn’t care too much for me making music. In order to keep her, keep the family together—I didn’t have nobody but her—I quit play music for twenty-five or twenty-six years. 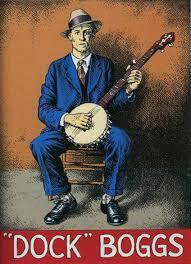 After I retired I said, just for sentimental reasons, I’m going back and get my old banjo. When I went back and got it, it cost me a hundred and ten dollars to have it fixed up, but it’s in good shape now and I’ve played and made several hundred dollars with it since. When Dock Boggs was a small boy, he became fascinated with the music of a black man named “Go Lightening” (probably “Golightly”), who would walk along railroad tracks playing his guitar. Young Boggs would follow the man and beg him to play: “and I’d follow him … a lot of times to get to hear him play two, three, four pieces and I a lot of times heard him play ‘John Henry’ and I learnt it partly, learnt some of the words from him”. This experience may have been Boggs’ first exposure to the open-tuned slide guitar style, the way in which “John Henry” is usually played; he would have been unable to apply the style to his music, however, because a slide implement does not work very well on a banjo. What developed from this experience was Boggs’ personalized banjo style, which combined the minstrel thumb-lead clawhammer technique with up-picking: his thumb thumped melody notes down on the lower strings while his fingers sounded both melody and accompanying notes on the two upper ones, his index finger on the second string and his middle finger on the first, with both picking up. Although her fingers were doing different work (i.e., brushing down and up), it was this basic thumb-lead style that young Maybelle Addington was applying to her Stella guitar some twenty miles southeast of Norton in Nickelsville, Virginia. Three of the four songs Boggs recorded that came close to the blues were learned from records made by African-American women. His best-known effort is “Down South Blues,” which he remembered hearing in the early 1920s and which featured a black woman vocalist with piano accompaniment. Alberta Hunter recorded the song twice in May 1923, once with Joe Smith on cornet and Fletcher Henderson on piano and once with Henderson only. Boggs’. Tony Russell believes that the singer was Clara Smith. In Dock Boggs’ 1927 recording of “Down South Blues”he punches out each note, both vocally and instrumentally, in an aggressive staccato attack. He clips off his words abruptly rather than playing around with them. Moreover, as Seeger points out, Boggs turns the “three-cornered” blues of the women into two-line stan- zas, about six bars each. He also rushes impatiently from line to line, cutting measures short, precluding any kind of call-and-response activity. Boggs seems to want to get through the song as quickly as possible; the tempo hovers around 114 bpm, and the performance is intense. The most unsettling feature of Boggs’ blues, however, is the singer’s sense of time, which gets derailed right from the beginning and never gets back on track. Unlike the many blues and jazz musicians who play with meter like they play with melody notes, lagging a little here, anticipating there, or playing against the beat (e.g., three against two), Boggs plays apart from the beat as though it has no relevance in his song. There is a huge difference between the controlled polyrhythms of black blues players and Boggs’ out-of-time music. These differences are due not so much to the latter’s misreading of the women’s performances as to a less-than-com- plete reading; certain important elements of the blues that Boggs heard simply did not register solidly in his consciousness. Boggs’ so-called receptive competence for African-American music, in other words, was compromised by culturally determined factors over which he had no control. In 1942 Dock Boggs experienced conversion and joined his wife’s church, the Old Regular Baptists, the fifteen thousand or so self- named “peculiar people” who range from the southwestern part of West Virginia to the Boggs’s patch of Kentucky and Virginia. Boggs became a community man. In the worst weather, in the worst times, he and others collected food and clothes for those who had none and carried them over bad roads in the dead of night; speaking of it, Boggs broke down weeping at the memory of the misery he served. In later years, when Boggs returned to his music, members of the Free Pentecostal Holiness Church of God on Guest River, his church then, would send him un- signed letters condemning him for his apostasy. In 1966, Marc Silber was the proprietor of a shop and lively musical hub in New York’s Greenwich Village known as Fretted Instruments. It was like a rustic bar that served guitars and banjos instead of drinks. He had gotten word that Dock Boggs (along with Mike Seeger and Mississippi John Hurt) was going to visit his shop on a particular day. Silber and an imaginative young employee named David Grisman prepared for the event by tuning every banjo in the shop to the non-standard (and for that time and place – utterly mind boggling) tuning believed to be preferred by the legendary Boggs. They were going to pretend they believed this was the normal way banjos were tuned. 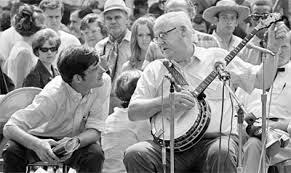 The visiting dignitaries arrived in due course and Dock Boggs did inspect the banjo stock as expected. Now I was puzzled. Wasn’t he a retired coal miner? “I asked him what he did for a living at home in Virginia,” Marc continued, “and he told me, ‘Why, I’m a banker’”. I thought about this for a few days.-Dock Boggs a BANKER?-Dock Boggs of the UMW who lived in a little community called Needmore?.– (the name says it all) – and I thought about the tuning and wondered if the New York pranksters had got it wrong somehow. So I reckon that Boggs knew pretty quickly that he was being kidded and quietly, deftly, played his own little joke that took 30 years to play out. The concert by Dock Boggs and John Hurt was an extraordinary event. Mike Seeger, who had recently rediscovered Dock Boggs in Norton Virginia, hosted the show and accompanied Dock gracefully on guitar. The evening highlighted some striking parallels and contrasts in the careers of Boggs and Hurt. Dock Boggs and John Hurt collaborated on one piece for their New York audience: the evening’s final tune, “Banjo Clog,” featured banjo by Boggs and clog dancing by Hurt. The two then parted ways and pursued their new recording and performing careers. The site also contains discographical info, tunings, biography, articles, stories, photos, and audio clips of interviews with Boggs.